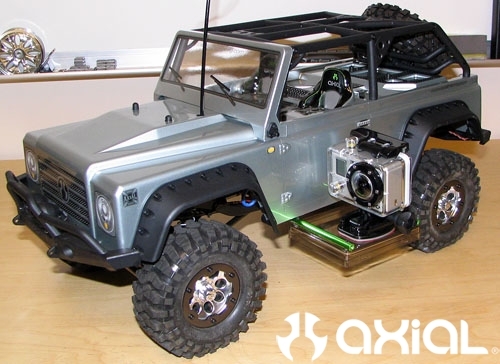 I’ve been thinking about the direction I want to go with recording some video of Axial’s new SCX10 TR. I’ve edited quite a few videos over the last few years, but never have had the chance to work with any on-board video yet. So, we picked up a new waterproof GoPro camera to shoot some on-board video. 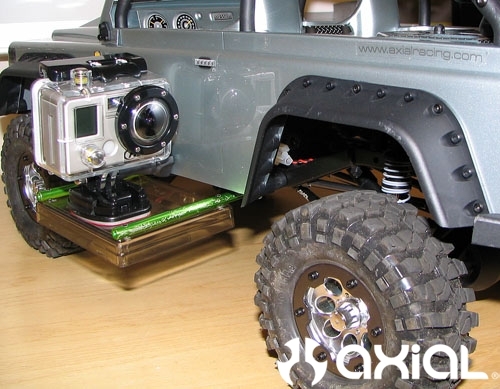 The GoPro package includes a handful of different mounts for the camera. Now it was just a matter of coming up with a few different mounting points on the truck to get the shots I have in mind. 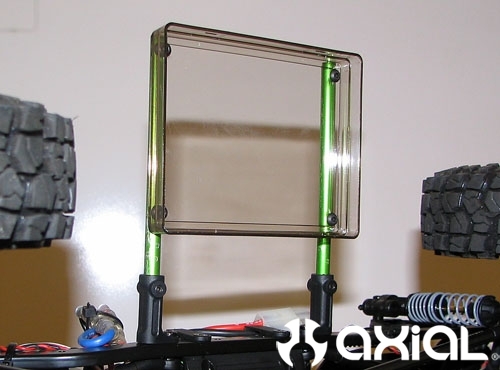 Here’s a little sneak peek at what I came up with for a simple, yet effective, camera mount. 1. First thing I did was remove the rock slider from the drivers side of the truck by removing the small M3 set screws that hold it in place. 2. Next, I grabbed some old suspension links I had laying around my office. They slide right into the rock slider mounts with ease. I installed a few short set screws to hold the links in place. 3. Then, I removed an old lid off of a plastic servo case I had here as well. This will be what the camera sits on. I laid the plastic lid from the servo case over the links as they sat in place and marked 4 holes with a marker where I needed them to be, one in each corner. Then, drilled the holes out using an 1/8″ drill bit by hand. 4. With the holes in place on the plastic lid I then used my marker again to transfer the hole pattern from the lid onto the suspension links. 5. I removed the links and drilled two small .099 holes in each link over the needed hole pattern. Then, using a little lube, I ran an M3x.5 tap through all four holes in the links. 6. I reinstalled the suspension links into the rock slider mounts and used four M3x8mm screws to tie the lid to the links. 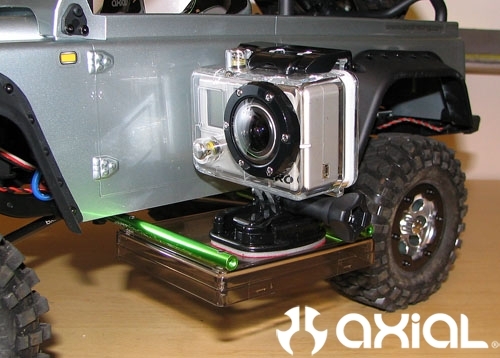 Now, I have an easily accessible camera mount that can shoot video looking from the front or back of the truck. 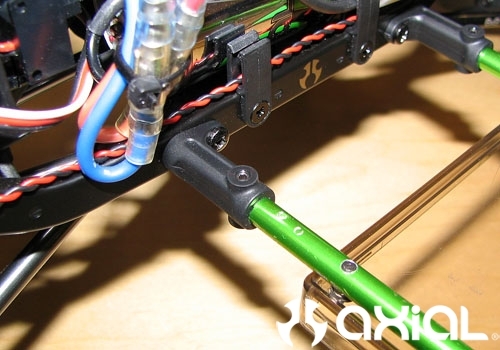 Which is easily removable and also adjustable by sliding the links in or out of the rock slider mounts. If you want a mount that will put up with more abuse then this, use a small sheet of aluminum flat stock instead of the plastic servo cover I used. Now, with the camera mounted where it is I should be able to get some great on-board footage that looks super realistic. Keep an eye out for the video. Once it’s done I will post it up here on the blog. Nice setup! 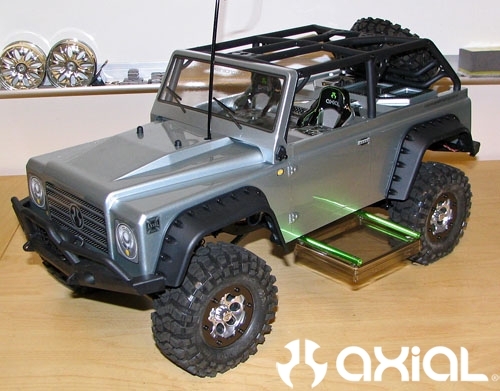 I think I’m gonna get one for scaler/crawler/rock racer use! Which GoPro are you using or would recommend? We bought the GoPro with the wide angle lens. Great job getting the camera mount on your truck it looks very good.